Son of Isaac and brother of Nicolai Bakst; died Oct. 8, 1895; was employed as interpreter (dragoman) in the Asiatic Department of the Russian Foreign Ministry, and is known also as a publisher of Russian translations of scientific works, such as Helmholtz, Schleiden, Claude Bernard, Draper, etc. 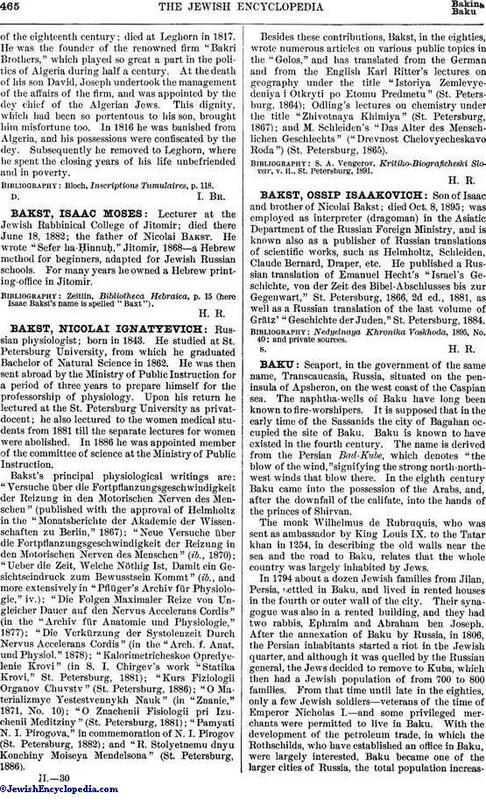 He published a Russian translation of Emanuel Hecht's "Israel's Geschichte, von der Zeit des Bibel-Abschlusses bis zur Gegenwart," St. Petersburg, 1866, 2d ed., 1881, as well as a Russian translation of the last volume of Grätz' "Geschichte der Juden," St. Petersburg, 1884. Nedyelnaya Khronika Voskhoda, 1895, No. 40; and private sources.